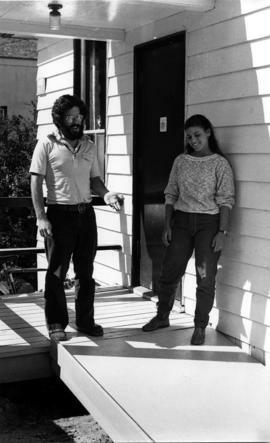 Photograph depicts Rabbi Daniel Seigel and a young woman on a porch. Photograph depicts Rabbi Daniel Seigel riding a bike. Photograph depicts an unidentified man and Rabbi Solomon holding something in a frame. 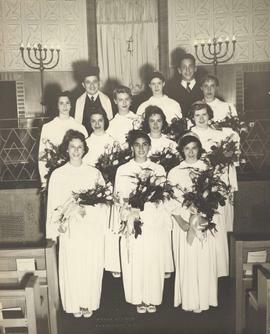 Photograph depicts a group of people in a library including Rabbi Wilfred Solomon.Written on the verso: "Page 3 - 1 x 2 3/4. Jul 6 1973. Rabbi Wilfred Solomon." Photograph depicts Rabbi Wilfred Solomon and Cantor Murray Nixon on the bimah.